Yeah. I’ll just stop while I’m ahead – I’m sure you guys get the idea. Obviously, following this pattern, the Romans should have been no strangers to the power of the number three. And guess what? Along with the group of 12 Dii Consentes, the Romans honored triads of deities who were very important to the state. And guess how many of these triads there were? Did you guess 3? you did? Oh, you smart cookie, you! These triads were, like all other things, given names: there was the Aventine Triad, the Archaic Triad, and, the most famous, the Capitoline Triad. The cult of the Aventine Triad was established in 493 BCE on where else but the Aventine Hill. This was the so-called “plebeian triad”, both because the deities worshiped were popular with the plebeians and because the Aventine was traditionally the plebeian’s/people’s hill. During a time of famine, war, and threatened plebeian secession from the city, the then-dictator Aulus Postumius vowed a temple to be built to the three deities of the plebeians – the temple was built, and the famine and dissension ended. The deities of the Aventine Triad were Ceres, Liber, and Libera. Ceres is the well-known goddess of grain and agriculture, Liber is a god of wine, freedom, and fertility associated (and later assimilated) with Bacchus, and Libera is a goddess of fertility and the female counterpart to Libera – she was later associated with Persephone/Proserpina. The Archaic Triad is a sort of proto-Capitoline Triad. The original deities were Iuppiter, Mars, and Quirinus. Scant resources are available for information on the Archaic Triad: in fact, really only fragments from Servius, Polybius, Livy, Plutarch, and Festus give us any idea of the existence of this triad. Georges Dumezil, always ready to leap to the call of his love-affair with the so-called “Proto Indo-European religion”, thinks that these deities symbolized the major stereotypical roles of the high offices of that religion. According to him, Iuppiter was a stand-in for the king, Mars your standard deity of war, and Quirinus the deity sacred to and the protector of the average Joe people. Finally, the Capitoline Triad is the later version of the Archaic Triad. Iuppiter still held his place as the sovereign, but Mars and Quirinus were pushed aside to make room for Minerva and Iuno. These deities were honored in temples known as capitolia throughout the Roman world, but the main temple was the Temple of Capitoline Iuppiter, the Best and the Greatest (aedes Iovis Optimi Maximi Capitolini). Each deity had their own cella, or room of the cult statue, within this temple. 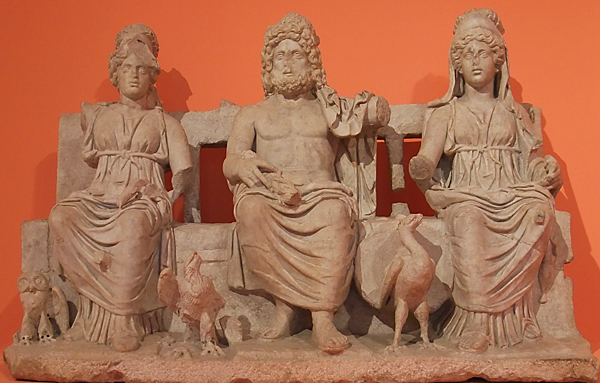 Statue of the Capitoline Triad, with Minerva on the left, Iuppiter in the center, and Iuno on the right, each accompanied by their sacred animals. Apparently, this is a mirror of the sacred Etruscan triad of Tinia, Menrva, and Uni. Saturnus is a very old, very important deity. He lends his name to not only the ancient Saturnalia festival, or to a description of character, but also to one of the planets of our solar system and a now bankrupt car company. To name a few things. He is one of only a few deities to whom one sacrifices with their head uncovered, and not even the ancient Romans know why that was. However, he is usually depicted with his head veiled – so the sacrificing with the head uncovered might have come from the Romans not wanting to imitate him. According to one tradition, he was a mortal king who reigned over either the Capitoline hill or Latium long before Aeneas had even been born. He ruled with Ianus, another mortal (in this myth), during the great Golden Age; the Capitoline hill was, in the archaic period, called the Saturnian hill. The other, more famous tradition comes from his association with the Greek Titan Kronos, though it diverges majorly from the Greek myth at the point when Zeus imprisons Kronos. In the Roman version, Kronos/Saturnus fled Zeus/Iuppiter and took refuge in Latium – the name Latium comes, according to the antiquarian Varro, from the Latin verb lateo, which means “to hide”. Once in Latium, he was received by Ianus – either the mortal king or the deity – and ruled that kingdom. He introduced agriculture and “civilization” – laws and customs – to the people. His consort in the archaic tradition was Lua, and later on Ops: Lua may well be an epithet of Ops, meaning “destruction” or “unbinding”, but she was herself usually ascribed the epithet Mater (Mother) or Saturni (of Saturn). According to the scholar John Scheid, Saturnus is the god of unbinding and loosening. We can see this from the opening ritual of the Saturnalia and the statue of Saturnus in his temple: the statue was filled with oil and it’s feet were kept bound with wool throughout the year, being loosened at the start of the Saturnalia. He was the guardian of the public treasury, which was located at his temple. Saturnus is the god of sowing, so harvest and agriculture, (his name from satu, sowing) and of time. Along with being depicted with a covered head, he is usually shown with a sickle or key and a serpent. In my Latin in translation class the other day, we were discussing whether or not the Romans had a word for religion, and if so, what it was. Spoiler alert: they didn’t. The closest words that they had were probably the words cultus and pietas: in other words, the (loosely translated) cult/”knowledge of giving the gods their due”, and one’s loyalty and duty to friends and family. But one student suggested that the word “superstitio” was the Romans’ word for religion, with all the connotations that our word “religion” has today. This about threw me into mad little fits of laughter. While superstitio may have been a word used to describe some religious practices and religions, and while religious people could be superstitious, it was by far not what the Romans would have called their own practices. The thing is, superstitio was NOT a good thing, and to be called superstitious was, obviously, likewise not a good thing. Superstitio is excessive devotion and enthusiasm in religious practices, or doing practices that conflict with traditional Roman practices. According to Cicero, superstitio is the “empty fear of the gods”; Seneca defines it as “something that wrongs the gods”, unlike religio, which “honors the gods”. Superstitio could be anything from magic to other foreign religions, such as Christianity and Judaism. Some modern scholars think that it was something thought to be natural to slaves and women. The Christians later adopted the term to use as a descriptor for “pagan”, or “false religions”. Well, I couldn’t resist. I guess this fell perfectly into place – as today is my birthday, and I haven’t done any “B” posts for the PBP yet, here’s a birthday-centered post! I’m not one to get very excited about things, and birthdays are no exception. Sure, it’s nice to hear from family and friends, but I tend to see it as just another day. I know that birthdays are supposed to be happy days celebrating life, and it is: but when you celebrate being alive with the little things each day, it’s not as…big of an event, I guess. I’ve been known to forget that it’s my birthday. And when you’re stuck at university and work literally all day, it kind of takes the fun out of it. But even with my whole attitude towards birthdays, I wanted to do something. So, when I started this path a few years ago, I looked up the ancient Roman practices, and really wasn’t surprised by what I found. They had parties. Lots and lots of parties. The Romans loved a good party. So then I decided to see if any rituals were done on birthdays in particular. I know that the “birthdays” (or temple dedications) of deities are celebrated, but were there any rituals that people did for themselves? Women honored their natalis Iuno, or “Iuno of birth”: possibly the goddess Iuno, possibly a guardian spirit like that of a man’s genius. According to Tibullus’ Elegies, they did so by giving a triple offering of liba (cakes made of boiled salted wheat) and a triple offering of wine. It was typical for a man to honor his genius on his birthday. He would do so by invoking his genius with prayers and vows called bona verba. Then, he would offer up wine and incense onto the fire of the lararium. So this morning, in the fashion of a traditional offering, I made some simple liba and offered those and some wine to my natalis Iuno. And that’s not all, because today just happens to be the Ides of September, a day sacred to Iuppiter. So He was given some incense, too. The altar (Latin ara/arae pl.) was perhaps the most important feature of a sacred space or temple (so important, in fact, that I typed the word ‘important’ twice and didn’t even notice ;]). It was here that offerings to the gods were given, with the exception of offerings to chthonic deities. The ara stood outside of either a temple building, usually in front of the steps, or in some other place such as crossroads (dedicated to the Lares Compitales, or Lares of the Crossroads) or a forest. It was typically dedicated by a wealthy patron who wished to perhaps fulfill a vow made to the deity for whatever reason. Next to the main altar were often erected smaller, temporary altars to “guest deities” associated with the deity who “owned” the temple. Altars could be small or large, and they were usually shaped as either a tall block or a cylinder. They were often decorated with motifs such as vines and ox skulls, and bore an inscription with the name of the man who dedicated the altar and the god to whom it was dedicated. Two of the most famous altars in Roman history were the Ara Maxima and the Ara Pacis Augustae. The Ara Maxima, or Great Altar, was an altar dedicated to Hercules. It was said that Hercules came to Italy during his travels and rid the area around Rome of a monster named Cacus, who had been stealing and mutilating cattle. Relieved, the people set up an altar in His honor and put the Potitii and Pinarii families in charge of His cult and sacrifices. 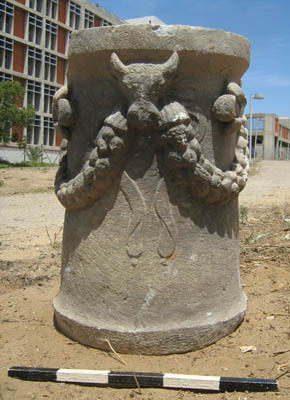 The altar was located in the Forum Boarium. The Ara Pacis Augusta, or Altar of Augustan Peace, was dedicated on 30 January, 9 BCE in the Campus Martius. It was built in honor of Pax, personified Peace, and the “Augustan Peace” brought about by Augustus’ army, though it was really a huge piece of propaganda. Just like Virgil’s Aeneid. The Ara Pacis bears beautiful carvings of mythology, deities, and religious processions on its four walls. It was actually commissioned by Mussolini to be rebuilt in the late 1930s. You should look up pictures of the panels if you’re interested: they are fascinating! For the purpose of divination, the ancient Romans employed a variety of methods. One of which was haruspicy, which I wrote about for another PBP entry here. Another such method was called auspicia. The state magistrates were in charge of “taking the auspices”, to use the modern English translation. This was done by observing birds: the type of birds, the number of birds spotted, the sounds that they made, the direction of their flight, and their location were all taken into account. Such birds included ravens, owls, hens, eagles, and vultures. There were two different types of auspicia: auspicia impetrativa, which were signs requested from the gods, and the auspicia oblativa, which were signs that were not sought out or requested but showed themselves on their own, as a sign from the will of the gods. Auspicia impetrativa had to be taken within a complex set of rules and parameters. To do so, the magistrate would start by putting up a tent on a spot of ground previously consecrated by the augures (augurs) for the express purpose of taking the auspices. This area was called the auguraculum, and there were three such spots in the city of Rome: one on the citadel (the Arx), one on the Quirinal hill, and one on the Palatine hill. Then the magistrate would sleep in the tent until just before dawn, when he would take the auspices: and they were only valid for the one day and decision that were taken. There were few reasons and events that would justify the taking of the auspices, and they all pertained to important governmental or military matters: calling assemblies, sending men overseas, battles, etc. The auspicia let the magistrates know if the gods approved or disapproved of a public action to be undertaken in the future, and Iuppiter was always asked to make his (dis)approval known before action would be taken. Before the third century BCE, auspicia were taken by observing the flight of birds. After that, however, the preferred method was observing the eating patterns of chickens: if they ate healthily, the action was approved; if they refused to eat, that was a sign that the gods disapproved. Obviously you can see that this system was able to be easily cheated, and it pretty much was: the chickens were starved until the appointed time of the auspicium, and then they were given food, which they would scarf down. He suffered a catastrophic defeat, which was supposedly because he hadn’t taken the auspices properly. The other type of auspicium is the auspicia oblativa. These were mostly things called prodigies, and that doesn’t mean the gifted child that can play Mozart by the age of 3. These prodigies were bad omens, and were said to be the manifestation of the wrath of the gods. These included typical things like epidemics and defeats in battle, and not so typical things like “the shrinking of the sun, the spontaneous combustion of weapons, two moons seen in the sky during the day, red-hot stones raining down from the sky, bloody sweat forming on statues, and sheep turning into goats”, as written by Livy.